On our second night in Houston, Texas, my wife and I were enticed into a Tex-Mex joint called the Dizzy Kaktus by the promise of cans of Buffalo Bayou 1836 copper ale for $2 (or it might have been $3 per can, but it was cheap either way) and discounted tacos. Blurb on the can: If you have to ask what 1836 stands for, please put this beer down and leave our country. The review: Umm, I’m not going to lie, I had no idea what 1836 stood for, so, at the risk of being kicked out of ‘Merica, I asked my server what happened on that date. Turns out the man was a dirty rotten foreigner like me; he had no friggin’ idea what 1836 stood for either! Bloody typical. I believe now that it probably has something to do with the founding of the state of Texas, but here’s a tip for the Buffalo Bayou Brewing Company: maybe don’t put something like that on the side of the can, unless you like appearing intolerant, xenophobic, nationalistic, and just plain hateful of outsiders. Now that I’ve gotten that off my beer belly, let’s talk about the beer itself, which was actually quite good. Hazy copper coloured and medium bodied, 1836 tastes of sweet caramel malts and mild hops, smells of weak citrus and warmed barley, and generally goes down pretty well with a plate full of tacos. 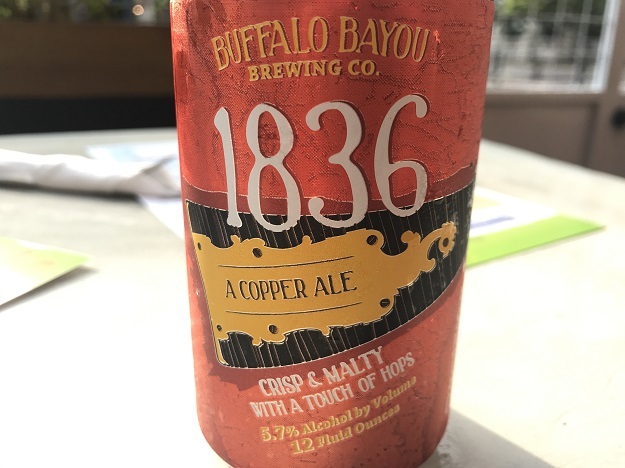 The verdict: Jingoistic can aside, Buffalo Bayou’s 1836 copper ale is a reasonably decent beer – especially at happy hour prices. I had better beers on holiday in the USA, but I also had much worse ones. This is one of the beers I remember most fondly from my trip because of the meal I had with it. So, if you visit Houston, then make sure you check out Dizzy Kaktus for some terrific tacos. Beer/movie combination: I suppose I should recommend you pop open a can of Buffalo Bayou’s 1836 and watch a movie about the Alamo, but the truth is I don’t know if I’ve ever watched any (perhaps that’s the reason why I had no idea what that date signified). Being a New Zealander with dual citizenship in Britain, I’m much more familiar with English history. So, because 1836 was also the year before Queen Victoria’s reign began in England, I’m going to come out of left field and recommend you watch The Young Victoria.